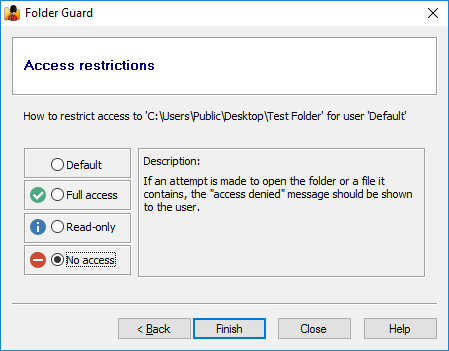 In addition to protecting folders with passwords, Folder Guard also allows you to hide folders and/or restrict access to them without creating individual passwords for each such folder. You can choose to hide a folder completely, or make it appear empty. You can also make a folder completely inaccessible, preventing someone from opening it, or make it read-only, that would allow the user to open and view the files within the folder, but prevent saving modifications back to the protected folder. Both folders and files can be protected with restrictions. If assigned to a file or a folder, this attribute unconditionally hides the file or the folder itself (and all files and subfolders the folder may contain). 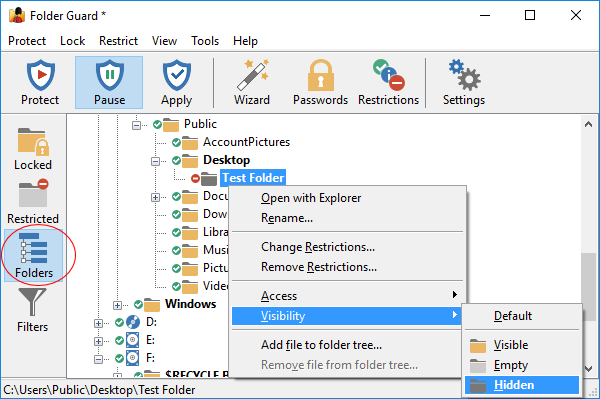 If assigned to a file or a folder, this attribute makes the file, or all files and subfolders contained in the folder, as well as the folder itself, to be visible in an Explorer window, as if Folder Guard were not present in the system. If assigned to a file, this attribute prevents opening the file, (or running the file, if it is a program). If assigned to a folder, it prevents opening the files this folder or any of its subfolders contain, unless you have allowed access to the specific files or subfolders, by assigning different access attributes to them. This attribute also prevents saving any modifications to the file(s) into the same folder, creating, deleting, or renaming files or subfolders. If assigned to a file or a folder, this attribute allows opening the file, or files in the folder, so that the contents of the file(s) may be viewed by the user, but prevents saving any modifications to the file(s) into the same folder. It also prevents creating, deleting, or renaming files or subfolders. If assigned to a folder, this attribute applies to all files and subfolders under that folder, unless you have assigned different attributes to specific files and/or subfolders of that folder. If assigned to a file, this attribute allows full access to it. If assigned to a folder, it allows for full, unrestricted access to the folder itself, as well as to the files and subfolders it may contain, unless specific files or subfolders have been restricted by you with their own access attributes. 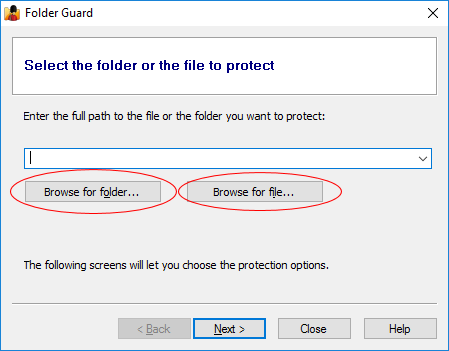 All operations, such as opening and saving files, renaming or deleting them, modifying their properties, etc., are permitted, as if Folder Guard were not present in the system. To see the restrictions in action, resume the protection (or Apply the changes), and the folder you've made hidden should become invisible to Windows Explorer, Windows applications, MS-DOS programs, and the command prompt. All files and subfolders that might be located in that folder will be hidden, too, until you pause the protection. 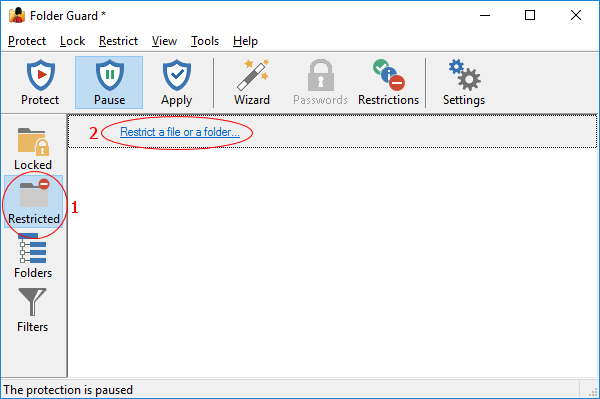 If you did not select to hide the folder, but only selected the no access option, then the folder would be visible, but an attempt to open it would result in the Access denied or a similar message displayed by Windows. 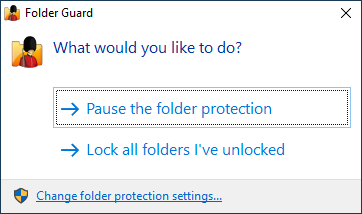 To allow access to such a folder, pause the protection. When done, resume the protection to make the folder inaccessible again. If you have not applied any restricting attributes to a folder, such a folder is considered to have the default attributes. (That's what most folders have initially, before you start setting up the protection.) The visibility of (and access to) such a folder is determined by the attributes of its parent folder: if the parent folder is restricted, its files and subfolders become restricted, as well, unless you have assigned different attributes to the files or subfolders, which would override the attributes inherited from the parent folder. Note that each folder can have different attributes for different users of your computer, so that the folder would be protected differently for each user. If you want to restrict a file this way, you need to use the Add file to folder tree command first, to make the file appear in the folder tree, and then use the right-click menu for the file, just as you would for the folder. If you want to restrict a file or a folder on another computer on the same network, use the View - Add network location command first, to make the network location appear in the folder tree, then navigate to it and set up the restrictions just as you would for the local files and folders. How do I make a hidden folder visible? 3. If you have set up a hot key of Folder Guard, you could press it to quickly display the prompt to pause or resume the protection, too. When the folder becomes visible, you can open the files it contains, and work with them as usual. When done, use the same commands described above to Resume the protection, and the folder will become hidden again, until next time you need to see it. 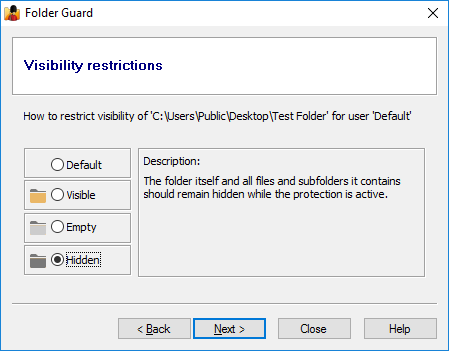 Of course, if you want to make the folder visible permanently, and not hide it with Folder Guard anymore, you can do so by removing restrictions from the folder using the main Folder Guard application.